The roles of mass media and social interactions on fertility transition are widely recognized for both ideational and behavioural effects; however, few efforts have been made to study the effects of both together so far. 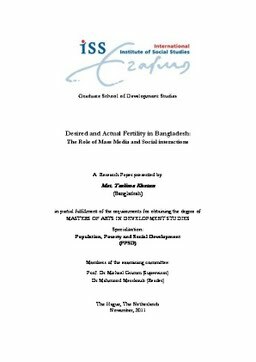 This study in investigating the determinants of fertility among ever married women of age 15-49 years in Bangladesh has made this effort empirically by using cross-section survey and qualitative data. The results show that social norm is the significant predictor of desired fertility; and the positive effect to higher order desires suggesting in Bangladesh still now on average society approves more than two children as ideal family size; however, access to mass media and social interactions increase individual’s probability of choosing small family as ideal. The study also unearths that individual who has higher desired number of children has higher number of actual births; and women empowerment contributes an important role in fertility decisions and implementations. Furthermore, the study finds variant effects of mass media, social interactions and social norms across socioeconomic groups regarding fertility. The findings of the research can be attributed to the successful interventions for shaping popular fertility ideals; consequently, fertility behaviour of the individual.